This is a reply to the false statement that Joesauntes made about G.I.JOES boots and feet being one and the same.The G.I. JOES I grew up with you could not only change thier foot wear but also thier cloths.I'm talking 1964 here.They were 11" tall with 21 moveable parts. Ever wonder what Ken and G.I. Joe did when Barbie wasn't around? They played war games, of course. Many controversial conversations between my friends and I about which Barbie would prefer: to sleep with GI Joe while he still had his boot on, or to take them off (in which case he would be footless, as his shoes and feet were one) and sleep with an amputee! Partly true, the creator and her husband were in Paris when she got the idea. 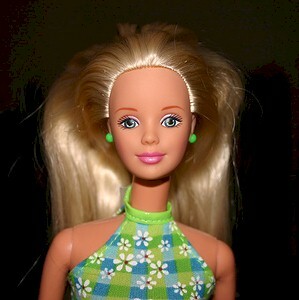 She then named the doll after her daughter and later came out with the Ken doll which was named for her son. I know Barbie has a very large and devoted following and I intend no disrespect in asking if anyone can tell me more about (or refute) a story I read in a Sunday newspaper a few years ago. It said German prostitutes used to make dolls as a pastime, when not otherwise engaged and that those dolls were used as models in the creation of Barbie.